MADISON, Wis. — In case you missed it, Wisconsin Gov. Scott Walker posted a lengthy attack against the small progressive advocacy organization, One Wisconsin Now. Here’s what has him up in arms. Our research found that since his 71-day presidential flame out in September 2015, Walker has racked up more than $818,000 flying the state airplane inside and outside of Wisconsin like it’s his personal shuttle. 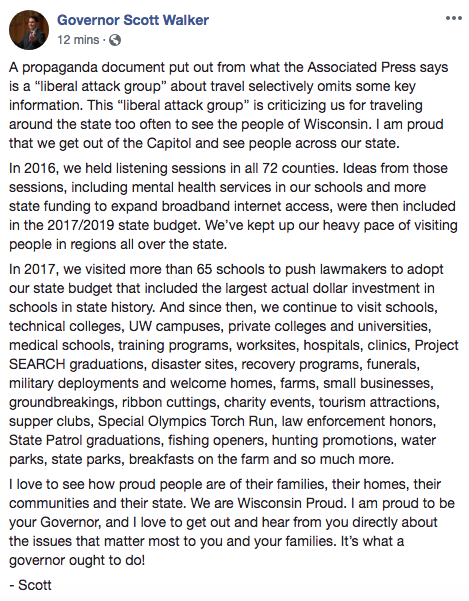 Our findings showed that among his 869 flights totaling 114,000 miles, Walker had a state plane fly halfway across the state to fetch him after a haircut so he could be shuttled to an NRA convention, used the state plane for a northern getaway date night with his spouse, and had the state plane fly him to a “Walk with Walker” event. Walker flew. To walk. 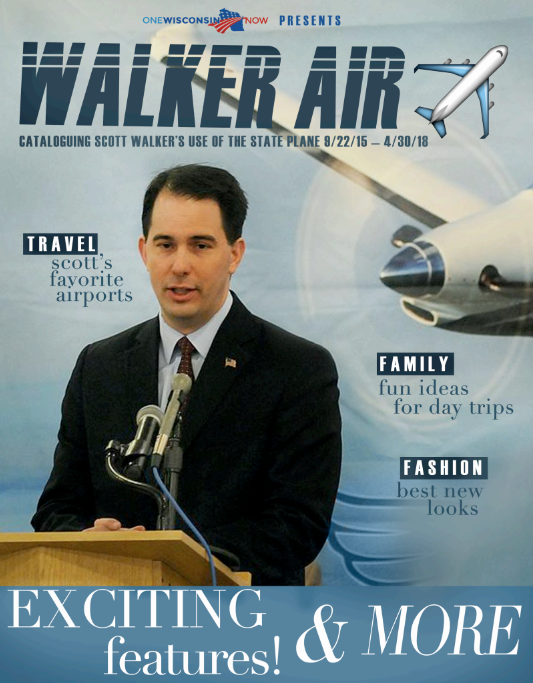 We have depicted all of this in a colorful “Scott Walker Air Inflight Magazine” for your perusal. The exits are located in the front and rear of the cabin. Please keep in mind that the closest exit may be behind you.